Project obstacles and solutions: The John Morrell Food Group announced that they were building a new $43.5 million, 426,000 square foot cold storage distribution center in Greenfield, Indiana. The facility would handle their meat distribution and required large refrigerated areas throughout the facility. It also required a large docking and staging area. Tippmann Construction was selected as the general contractor for this job and Lithko did all of the concrete work. 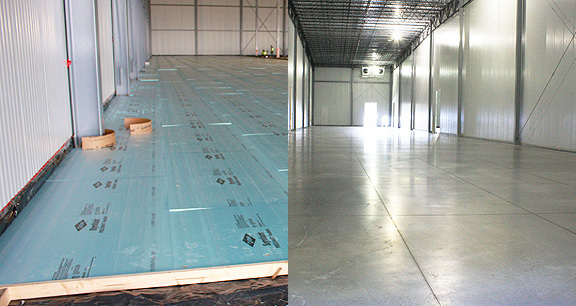 Tippmann specializes in cold storage facilities. Lithko has been recognized for their expertise in cold storage concrete flatwork. Unique to this project was the large refrigerated spaces throughout the facility. This included insulating the floors under the concrete. The refrigerated rooms were adjacent to swing rooms, which acted as a buffer for the temperature difference between the refrigerated rooms and the rest of the facility. Special attention needed to be paid to the concrete floors due to the freezing temperatures of these rooms. Lithko poured these rooms in small batches to have better control of the concrete being placed over the insulated floors. About half of the floors were poured with a conveyor delivery system. The rest of the floors were poured using buggies. The floors were finished to a fine smoothness. With very high racks and lift equipment rolling across the facility, the concrete could not curl or there would be a risk of damaging the floor. Because of the temperature extremes, the floors were required to have more control joints than typical. Curling can occur at the control joints. This was controlled with the coarse aggregates mixed into the concrete. IMI QC/QA worked with Tippmann to design floor mixes that used a high range water reducer to lower the water-to-cement ratio and eliminate curling issues. This produced a fine finishing paste that was troweled to a very smooth floor. IMI supplied 11,000 yards of concrete for the inside floors. Another unique aspect of this job was the outdoor staging and loading areas. With the weight and wear of constantly moving trucks across the surface, the engineers specified an 8 inch concrete slab with #3 rebar on 18 inch centers. The engineer also wanted to use a concrete mix with blended coarse aggregates. IMI routinely uses a blended coarse concrete mix for inside warehouse floors where no steel reinforcement is being used. The blending of large and small aggregates provides structural strength to the mix and reduces plastic shrinkage. In this case, the blended aggregate mix was used in outdoor concrete with rebar. IMI QC/QA also mixed air with this concrete and tested each truck to ensure it was within the engineering specifications. IMI supplied 18,000 yards of concrete for the outside driving areas. For more information on warehouse floors or loading areas, contact a sales representative in your area. Click here.